Ten Other Things You Might Not Have Known About 20th-Century Aboriginal History in Canada. July 25, 2013 July 24, 2013 24 Comments on Ten Other Things You Might Not Have Known About 20th-Century Aboriginal History in Canada. 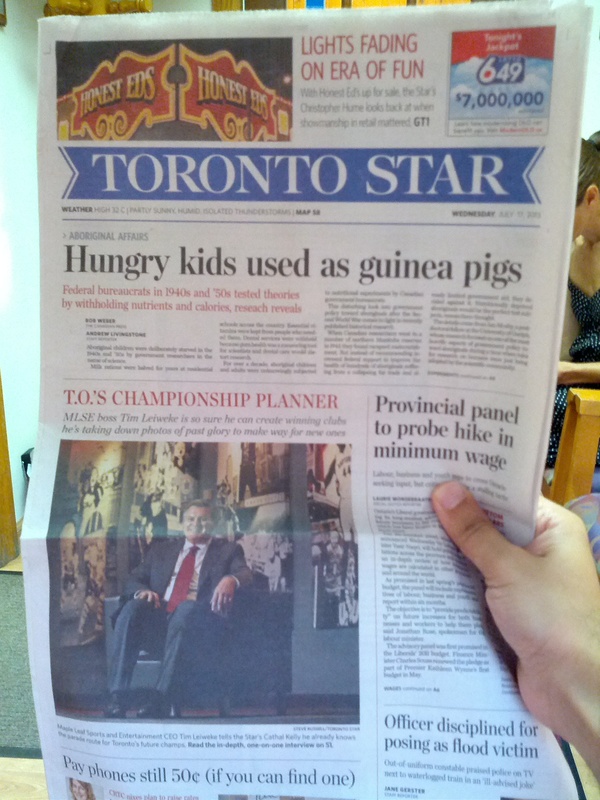 Ian Mosby’s research on nutritional experiments on Aboriginal people in the 1940s and 1950s featured on cover of Toronto Star. This paper originated from some documents Mosby found at Library and Archives Canada while working on his dissertation. He discovered evidence of a little-known federal government program of nutritional experiments on starving Aboriginal people. Nutrition scientists conducted a series of experiments on malnourished Aboriginal children and adults for a period between 1942 and 1952. The federal government did not seek informed consent from the more than 1,000 residential school children from provinces across the country who were unwittingly included in this biomedical research. Unfortunately, this kind of public attention to historical scholarship is rare, in part, because scholarly journals are often inaccessible to the public. The recent notoriety of Ian Mosby’s work has raised the matter of open-access publishing for Canadian historians. Aside from those with institutional and personal subscriptions to such journals, the broader public beyond academia almost never learns about new historical research findings. Thankfully,the editors and publishers of Histoire Sociale/Social History heeded the suggestions of a handful of #Twitterstorians and released Mosby’s article as an open access publication (for a limited time). Given that the American Historical Association just recently made the controversial decision not to support open access for recently completed dissertations, this example of Mosby’s important research is hopefully a reminder that making historical scholarship broadly accessible can serve a greater public good while not undermining the professional interests of scholars. 1. In the 1950s, the federal government relocated Inuit people to experimental colonies in the Arctic archipelago. 2. In 1933, the National Research Council subjected Aboriginal children of the Qu’Appelle reserve in southern Saskatchewan to experimental trials of BCG vaccines for tuberculosis. 3. Aboriginal people have fought for Canada in every overseas conflict in the twentieth century. 4. Throughout the entire twentieth century, Aboriginal people in British Columbia have organized politically for recognition of traditional land rights. 5. From 1969 to 1971, the federal government conducted “Project Surname” a program to assign second names to Inuit people in the Northwest Territories who traditionally did not have surnames. Prior to this project, the government designated so-called disc numbers to Inuit people for identification and tracking purposes. 6. From 1913 to 1931, all levels of government participated in the removal and erasure of nearly every Coast Salish village and Indian reserve in the City of Vancouver. 7. In 1962, the British Columbia government agreed to end enforcing ethnic controls on alcohol sales in the Indian Act, which prohibited the sale of alcohol to Aboriginal people. 8. During the 1946-48 public inquiry on federal administration of Indian Affairs, the Indian Association of Alberta first argued that treaty rights should be the foundation for Aboriginal citizenship in Canada. 9. In Ontario in the 1950s and 1960s, Noranda Mines operated a sulphuric acid plant on Serpent River First Nation territory that processed uranium from the nearby Elliot Lake mines. The detrimental environmental effects of sulphuric waste from the plant devastated the Aboriginal community in the years since the closure of the plant. 10. In 1922, Dr. Peter Bryce, Canada’s first chief medical health officer, published The Story of a National Crime, a book that outlined statistical evidence that Canada’s Aboriginal population was being destroyed by tuberculosis and the federal government had the means to stop it. The government ignored Bryce’s warnings and fired him for publishing reports on the tuberculosis crisis. If you have other open-access publications to recommend, please post the citations and links in the comments section below. Please do post other OA sources on this topic here. I know I missed a bunch in this round up. I also had numerous articles that I could not share here. Athabasca University Press makes all of its books available for free download. Included in that is Recollecting: Lives of Aboriginal Women of the Canadian Northwest and Borderlands, edited by Sarah Carter and Patricia A. McCormack (http://www.aupress.ca/index.php/books/120181). While a number of the works don’t pertain strictly to the twentieth century, it’s a valuable collection. Kristin Burnett’s article in the collection, “Obscured Obstetrics: Indigenous Midwives in Western Canada,” does come into the twentieth century and touches on the influence of Dr. Helen MacMurchy, Chief of the Child Welfare Division for the Department of Health. More importantly, it reveals the importance of Aboriginal midwives in the settler communities of the West. Thank you for mentioning Frank Howard and the history of First Nations voting rights. I had hoped to include an article or book on this topic, but I was not able to find out. If anyone knows of an OA source on this topic, please share it here in the comments. I think this would be a very interesting contribution to this list. I should also note that I tried to represent a number of different journals that had open access articles. All of these journals are non-for-profit publications that rely on subsidies, subscriptions, and a lot of volunteer labour. If you want to support this type of scholarship, consider subscribing. For example, Canadian Journal of Native Studies has an individual annual subscription fee of just $30. Not too bad. That is a superb reference. I spent some time browsing the Acadiensis archive, but I wasn’t able to turn up this article. There was a lot of good articles on Mi’kmaw history, covering the eighteenth and nineteenth centuries and there were some on the Donald Marshall Jr. cases, but nothing that fit this list well. This article, however, is very interesting. I was unaware that the federal government attempted to consolidate Indian reserves in the Maritime provinces. Also, I’m more familiar with BC history, hence the regional bias in my selections. Thanks again for the excellent recommendation. Also of significance is Bill C-31 to Amend the Indian Act, passed into law in April 1985 to bring the Indian Act into line with gender equality under the Canadian Charter of Rights and Freedoms. It proposed modifications to various sections of the Indian Act, including significant changes to Indian status and band membership, with three major goals: to address gender discrimination of the Indian Act, to restore Indian status to those who had been forcibly enfranchised due to previous discriminatory provisions, and to allow bands to control their own band membership as a step towards self-government. On a personal note…my mother was granted her status back after having lost it in 1961, when she married my dad, a non-indian. She and many others were instrumental in the fight for the changes. Absolutely! This was one of the most important changes to the Indian Act in the 20th century. I don’t really have an article to share, but while doing research on Canada’s federal prisons in the 1930s I came across a number of documents on prison labour that indicate clothing for Residential Schools was manufactured by convicts at Kingston Penitentiary. This may have continued after the Second World War, but I have yet to find any concrete proof: certainly this practice of long standing, as there are references as early as 1900 to contracts for ‘Indian Clothing’ and school uniforms between the Department of Justice and the Department of Indian Affairs. That sounds like a very interesting discovery. You should post more info as you continue your research. I went to residential school in the fifteys an had to sit an mingle with known tb students. and to this day if i took a test for tb i would test positive. Thanks for sharing some of your story. Maureen Lux’s research provides insight and detail into the history of TB in the residential schools, but obviously the lived experiences of survivors tell a story that historians can never know. The following website on BC Aboriginal History with which you may be familiar is an interesting one. http://www.canadianmysteries.ca/sites/klatsassin/home/indexen.html Under the heading “Great Unsolved Mysteries in Canadian History –We Do Not Know His Name Klatsassin and the Chilcotin War” the website has some interesting articles and an extensive bibliography http://www.canadianmysteries.ca/sites/klatsassin/archives/chapterinbook/indexen.html which includes documents, letters, correspondence, articles from newspapers and much more. I recently read “Voyages of Hope: The Saga of the Bride-ships” by Peter Wilton Johnson. The author provides evidence that the Bride-ships were an experiment in social engineering. The book presents the history of several women who emigrated from England to Vancouver Island in the 1860’s. These women were sent over as governesses and servants for the upper class families and brides for the miners in order to save the miners from “going Indian” and marrying native women and renouncing Christianity. Even though the book is about the hardship of the voyage, the author provides some insight into marriage between miners and Aboriginal Women. Thanks for sharing that here. Canadianmysteries.ca is an excellent resource for history educators and those who simply want to know more about the Canadian past. I also think the Chilcotin War is a very important case study that refutes the myth that Canadian colonization of First Nations territory occurred peacefully and without resistance or violent conflict. Dear Sean.. You have no idea, how grateful I am to you for bringing all this forward. I truly hold you in high esteem for all the work you have done.and all the other good folks who have come forth to bring these awful truths to light. If it were up to me I would make you an HONOURARY CHIEF, on the spot, with the highest honours. I spent 12 yrs in Rez school and I told people that we were given prison garments to wear but no one believed me. When dignitaries came they gave us proper clothing and more food instead of the usual starvation rations. The gov’t is still stonewalling the Native People where money is concerned. They give just enough to make sure that the Native programs do not succeed. The relationship between the Natives and the colonizers has always been an abusive one. Now they control with the refusal and with holding of money. There is no reason for Native People to be living in dire poverty. We have not been given our half share of our resources or the sale of our lands….. You may look into, where the money came from for building the CPR railroad, the Welland Canal and Osgood Hall. It came from Native money…. Queenie…an OJIBWAY ELDER. Thanks for reading this post and thank you for sharing your experiences here. I think much of this historical research is a reminder that the official apology from the federal government should be a call to bring this history to light. The Truth and Reconciliation commission cannot complete its work until we know the truth.